The Ghost of Christmas Present is the second of the three spirits (after the visitations by Jacob Marley and the Ghost of Christmas Past) that haunt the miser Ebenezer Scrooge, in order to prompt him to repent. When he first appears before Scrooge, he invites him to "come in and know me better, man." 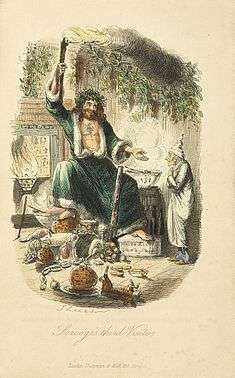 According to Dickens' novel, the Ghost of Christmas Present appears to Scrooge as "a jolly giant" with dark brown curls. He wears a fur-lined green robe and on his head a holly wreath set with shining icicles. He carries a large torch, made to resemble a cornucopia, and appears accompanied by a great feast. He states that he has had "more than eighteen hundred" brothers and later reveals the ability to change his size to fit into any space. He also bears a scabbard with no sword in it, a representation of peace on Earth and good will toward men. The spirit transports Scrooge around the city, showing him scenes of festivity and also deprivation that are happening as they watch, sprinkling a little warmth from his torch as he travels. Amongst the visits are Scrooge's nephew, and the family of his impoverished clerk, Bob Cratchit. The spirit also shares a vision of Tiny Tim's crutch, carefully preserved by the fireplace. Scrooge asks if the desperately ill Tim will die. The Ghost first states that "If these shadows remain unaltered by the Future, the child will die," then – quick to use Scrooge's past unkind comments toward two charitable solicitors against him – suggests he "had better do it, and decrease the surplus population." The spirit finally reveals to Scrooge two emaciated children, subhuman in appearance and loathsome to behold, clinging to his robes, and names the boy as Ignorance and the girl as Want. The spirit warns Scrooge, "Beware them both, and all of their degree, but most of all beware this boy, for on his brow I see that written which is Doom unless the writing be erased." The spirit once again quotes Scrooge, who asks if the grotesque children have "no refuge, no resource," and the spirit retorts with more of Scrooge's unkind words: "Are there no prisons? Are there no workhouses?" In the 1935 film Scrooge he is played by Oscar Asche. Also unlike most versions he is bald and clean shaven. In the 1938 film A Christmas Carol he is played by Lionel Braham. In the 1951 film Scrooge he is played by Francis De Wolff. In the 1962 TV special Mister Magoo's Christmas Carol, he appears before the Ghost of Christmas Past was meant to. In the 1970 musical adaptation Scrooge, Kenneth More portrays the main character. After a song ("I Like Life"), the ghost takes Scrooge to Cratchit's house to see a brief argument after Bob claims that the dinner is courtesy of Scrooge instead of Bob's compensation, followed by a song by Tiny Tim ("The Beautiful Day"). After questioning the ghost about Tiny Tim, the ghost takes Scrooge to his nephew's house for a round of "The Minister's Cat" before the ghost leaves Scrooge back in his home to meet the Ghost of Christmas Yet to Come. "Ignorance" and "Want" do not appear in this adaptation. In the Academy Award-winning animated film A Christmas Carol (1971) he is played by Felix Felton. In a 1979 Dutch musical De Wonderbaarlijke Genezing van (The Wonderfull Cure Of) Ebenezer Scrooge, he is played by Paul van Gorcum. In the Disney 1983 animated adaptation titled Mickey's Christmas Carol, Willie the Giant (voiced by Will Ryan) portrays the ghost. "Ignorance" and "Want" do not appear in this adaptation. In the 1984 film starring George C. Scott, the spirit is portrayed by Edward Woodward. He appears almost exactly as described in Dickens' book. The Jetsons episode The Jetsons Christmas Carol portrays the spirit as of course a "present", a festively wrapped gift box with enough of a sense of humor to illustrate the pun: "I'm Spirit #2!" he announces to Spacely. In Blackadder's Christmas Carol (1988) Ebenezer Blackadder is visited by "the Spirit of Christmas" (played by Robbie Coltrane) who bears a close resemblance to the Ghost of Christmas Present of Dickens' version. The 1988 film Scrooged's incarnation of the ghost is a violent, shrill fairy played by Carol Kane. In A Flintstones Christmas Carol the spirit is portrayed by the unnamed man who was seen earlier in the cartoon disguised as Santa Claus, ringing a bell outside a department store. The Ghost of Christmas Present is featured in The Muppet Christmas Carol. He appears as a full-bodied Muppet with the face and voice performed by Jerry Nelson and his in-suit performer is Don Austen. Like in Mickey's Christmas Carol, "Ignorance" and "Want" don't appear. As he disappears after midnight strikes, he warns Scrooge of the coming of the Ghost of Christmas Yet to Come before saying (in a variation of the ghost's well-known line) "Go forth and know him better, man." The Ghost of Christmas Present is featured in the "Holiday Time!" entry of The Muppets Character Encyclopedia. In Ebbie the spirit is portrayed by Lorena Gale, who also played a gift wrapping employee of Dobson's. In the 1998 animated musical television film An All Dogs Christmas Carol, Sasha becomes the spirit appearing to Carface Carruthers. In the 1999 film starring Patrick Stewart, the spirit is portrayed by Desmond Barrit. Roger Taylor of Duran Duran fame portrays the spirit in A Diva's Christmas Carol (2000). In A Carol Christmas (2003), William Shatner portrayed a TV talk show host named "Dr. Bob" (who habitually spouts off cliches) appears before Carol Cartman as the spirit later in the movie. In Bah, Humduck! A Looney Tunes Christmas, Yosemite Sam (Maurice LaMarche) is portrayed as the Ghost of Christmas Present. In the 2009 film Disney's A Christmas Carol, the ghost greatly resembles the version in the novel. (Jim Carrey voices all three ghosts, and Scrooge himself.) This version is depicted dying at length when midnight strikes (to the point of dissolving into a skeleton before the twelfth strike) and his warning about Ignorance and Want is also shortened, only saying "Beware them both" as the forms of Ignorance and Want rapidly turn into adults and repeat Scrooge's unkind comments he had said to the charitable gentlemen from earlier (Ignorance appearing in a prison cell, and Want being put in a straitjacket to be taken to a workhouse). In the Doctor Who's 2010 Christmas Special, Amy Pond dressed up as a police officer presents herself in a hologram as the Ghost of Christmas Present, eventually getting interrupted at some reprises by Rory Williams dressed up as a Roman after some remarks. He is represented by DeStorm Power as Kanye West rapping against Scrooge in the third season of Epic Rap Battles of History where he is known as "the ghost of whats right now". In the Thomas and Friends episode, Diesel's Ghostly Christmas, the Ghost of Christmas Present is portrayed by Paxton. In the 2016 My Little Pony: Friendship Is Magic episode "A Hearth's Warming Tail", Pinkie Pie (Andrea Libman) represents the "Spirit of Hearth's Warming Presents", named such for her avocation of gift-giving. She tours Snowfall Frost across the town to Snow Dash's Hearth's Warming Party singing "The Present's Filled with Presents". In the Animaniacs episode "A Christmas Plotz" The Ghost of Christmas Present is played by Dot Warner dressed in Victorian clothing. After emerging from a present (Dot: "ha ha get it it's a pun) she shows Plotz a movie about the security officer's life on Christmas Eve. Hearn, Michael P. (1989). The Annotated Christmas Carol by Charles Dickens; illustrated by John Leach; with an introduction, notes and bibliography by Michael Patrick Hearn. New York: Avenel Books. ISBN 0-517-68780-1.